Around the dinner table with my Dad's best friend, Peter Vin Courtney and family, sitting second from the right. When I was in junior school, I wished for dark skin like my classmates so they would include me in their after-school games. At Catholic church, I was baptized with a new christian name, Bernadette. As a child I thought perhaps my own name may not be recognized in heaven. 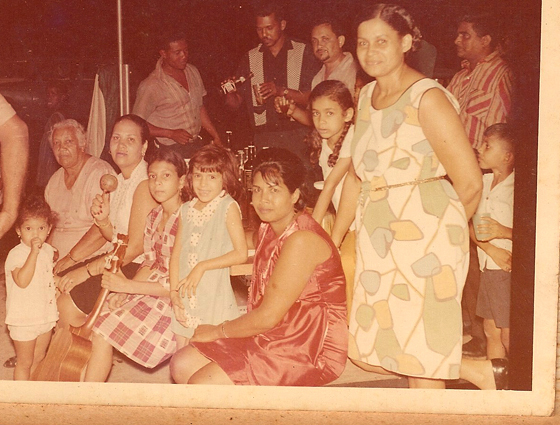 At the beach with my aunts, uncle and a slew of cousins, my brother sits front row second from left. During the August holidays, my brothers and I stayed with my mother's parents. We went to the Methodist church on Saturday with my Grandmother and on Sunday, to the Presbyterian church with my Grandfather. 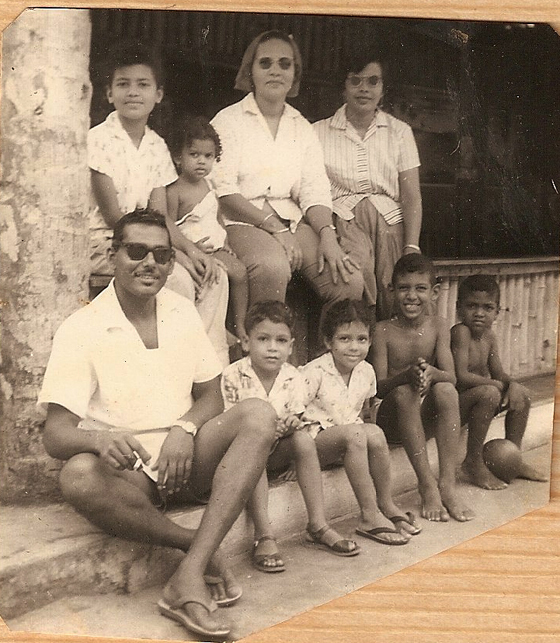 When we visited my father's Venezuelan mother, she spoke to us in Spanish, as if we understood. She lived in an aromatic kitchen with a breadbox that was never empty. 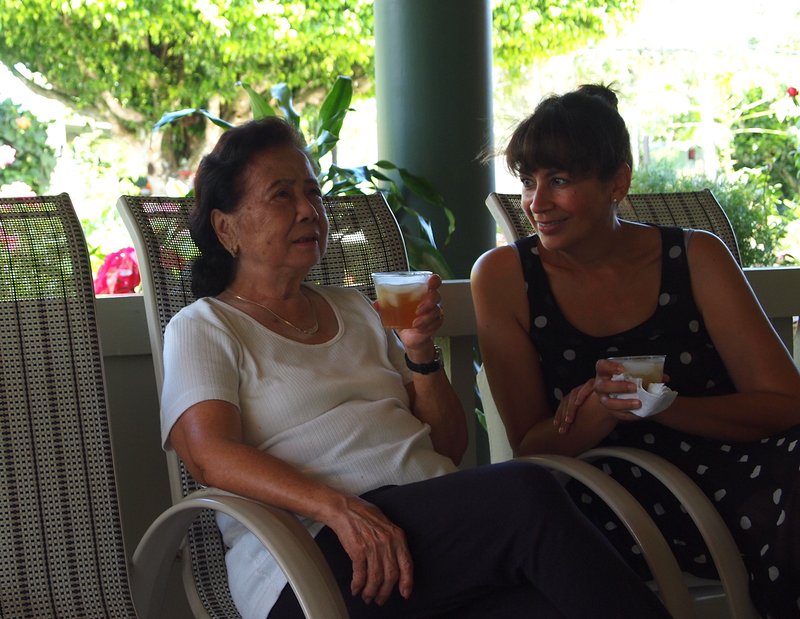 My Chinese godparents switched back and forth from English to Cantonese as they spoke to me or each other. When I visited, I always returned home with a unique gift from their homeland. 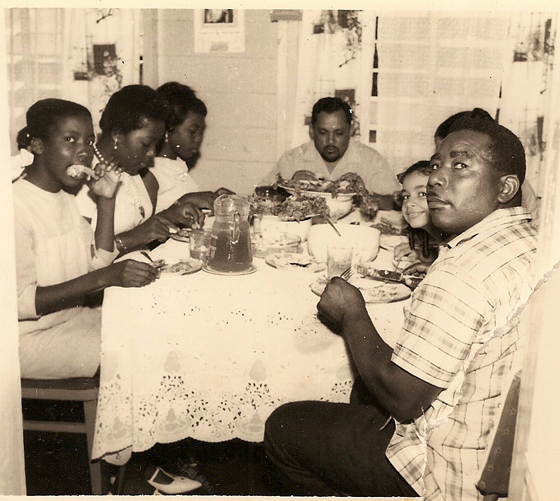 Family and friends gather for music, food and festivities. With braids standing next to my Mom. I had to say goodbye to my first boyfriend who followed me around everywhere at sixteen but would never invite me to his strict East Indian family home, even for a New Year's Eve Party. At the prestigious St. Joseph's Convent, a private school I attended, many close friendships with my white peers ended at 2:30 each day, at the close of school. At University, I lunched with my all-Canadian football player classmate who called me exotic, and wrote me poetry. My best friend at Art School was handsome, Jewish and gay. I get asked for directions in the subway by women speaking Farsi or Portuguese. A popular topic of conversation when I meet someone for the first time is usually "Where are you from?." And when I walk down the street, I see myself reflected in every face that goes by. A documentary about the discrimination that exists between the lighter-skinned and darker-skinned members of the same community, specifically how it affects young women within the African, Caribbean, and South Asian communities. is an organization that uses Hip Hop culture to break down the images, pressures, and issues young people face including the Roots of Beauty Ideals. "You may say I'm a dreamer but I'm not the only one. I hope some day you'll join us and the world will live as one."